Expected price of Vivo V5 Lite in India is expected to be Rs. 14,990. 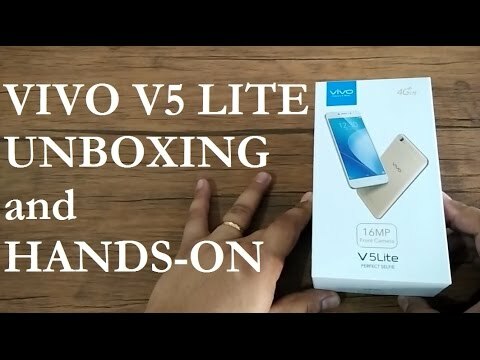 Vivo V5 Lite Expected to be launched on 28th December 2018. The 128GB / 3GB variant of Vivo V5 Lite costs around Rs. 14,990 and expected to available in Silver, Dark Blue and Midnight Black colour. Vivo V5 Lite is the affordable addition to Vivo’s selfie smartphones line in India. The phone comes with a metal unibody design featuring two antenna bands at the rear. It comes in rose gold and crown gold colour options, measuring 153.8 x 75.5 x 7.6 mm and weighing 155 g.
The right side of Vivo V5 Lite embraces a volume rocker and a power button whereas the top and left sides are pretty much empty. The bottom comprises a 3.5mm audio jack, a primary microphone, a microUSB 2.0 port, and a speaker grill. Vivo V5 Lite comes with a 5.5-inch IPS display with 1,280 x 720 pixels HD resolution, and Corning Gorilla Glass 3 protection up front. Above the display are a front facing camera, an earpiece, a proximity sensor, and an ambient light sensor. It comes with capacitive touch buttons for navigation. Vivo V5 Lite packs in a 1.5 GHz Octa Core Mediatek MT6750 processor, 4GB RAM, and Mali-T860 GPU. The device is backed by 32GB built-in memory for storing apps and files. If case you find this storage insufficient, you also get an option to expand it up to 128GB via microSD. In terms of optics, Vivo V5 Lite houses a 13MP rear camera with LED flash. Some of the camera modes and features include face beauty, panorama, HDR, slow-mo, voice capture, and more. It also sports a massive 16MP front-facing camera for selfies. Vivo V5 Lite is based on a 3,000mAh Li-Polymer battery with fast charging support. Completing the package are connectivity options like 4G VoLTE, Wi-Fi, Bluetooth, GPS, 3.5mm audio jack, and microUSB 2.0 port.